I’ve been wrestling with week nine of affirmations by Eric Maisel: “I will positively influence the process”. Have you ever gotten a song in your mind and find that it has taken up residence… is sitting in your favorite chair… is eating all of your chocolate? Well I have noticed a thought-line and it goes like this: the work weeks are filled with not enough time to get the jobs done, followed by weekends with not enough hours to play/recover/recharge. How, in the middle of this not-enoughness, am I going to positively influence the process? I decide to imagine the impossible and wander over to my writing desk and sit down. 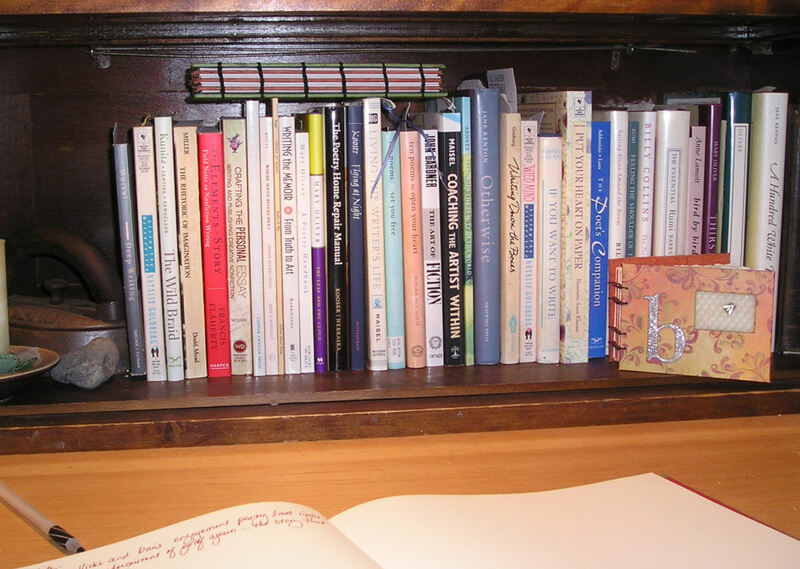 There, in front of me, a row of books… mostly poetry sprinkled with a few writing how-tos. I scan the titles to see who has an offering for my dilemma. Mary Oliver pokes me with her title “Why I Wake Early”. As yummy as it is to sleep late, waking early is what inspires me. Waking early and writing, painting or bookbinding while the rest of the world sleeps is the beginning of positively influencing the process. Waking early adds precious hours to my seemingly impossible days. What happens is a subtle momentum towards artfulness and this momentum is like stepping through a doorway… crossing a threshold from not-enoughness into contentment. Why? Because the slippery opponent in my wrestling match is inertia…the inability to move forward. Momentum is how I can positively influence the process and different mediums require different techniques. In my canvas work, I often start by prepping a pattern I have made. It’s the easy part… adding seam allowances, cutting away the pieces I don’t need, beginning to think about how it will go together. Once I am at the table, I begin to get comfortable with working for the day and the rest is easy. When I want to paint, I build momentum by covering the page with some color that pleases me and then working quickly, before my critical mind has a chance to chime in. I might make three attempts, three different paintings before I like the results, but the colors feed me… urge me on. Build momentum. For writing, sometimes just reading book titles will do. Other times, I use lines from someone else’s poem to get me started. toward the wild and open page. Even if my first efforts using a “stolen” line are not satisfying, I have primed the pump. I have begun. I have positively influenced the process. And it all started with waking early… rising to greet the day with creative anticipation…then finding a way to engage the muse. What will you do to build momentum toward your creative endeavors? What does Kelly, my fellow traveler on the affirmation adventure, do to positively influence the process? Next I Will Write in the Middle of Everything?? Hmm, I’m getting caught up on my reading at six am on a Saturday…your ruminations definitely make sense! Nice! I’m glad you chose my blog for your Saturday morning contemplation…and it is always good for me to re-read my ruminations and remember what wisdom I had in the moment that I have recently forgotten!